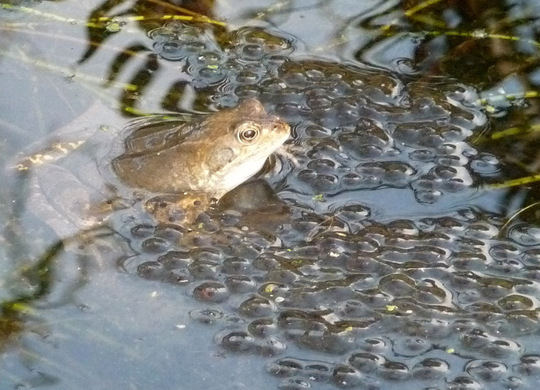 pond life : Busy frog. You can return to our pond life page or browse the pictures using the next and previous links. Thanks Janette....hoping for lots of little froglets ! Aye Janette...also had dragonflies visit and lay eggs last year.Apparently the larvae partial to tadpoles...so just as well there are going to be lots ! Dont have to be very big Janette...Sid made one from an old water cistern..and Sanbaz has just made a small one too for her garden ! The best thing is that the young frogs disperse into the grass in July...so no mowing allowed for a couple of weeks ! Flippin' heck, that's a lot. Wonder how many will make it to become a frog? BB ~ Will you have to protect it from the cold/snow we are apparently going to get? Oh San...probably be next year youre saying that...unless your frogs are late starters.Most of them have finished spawning now for this year.But just you wait next Spring ! Hi Pg..hopefully the jelly sac will give protection against the harsh weather ! Will keep informed on progress ! Lol...bringing back memories of school dinners here Janey ! Showing our age !!!! Ugggg no thanks, remember it well !!!! Great photo again Ray, what a huge family. I recall our son when he was young gathering frogspawn and having them in a jar indoors, that was ok until one day my wife saw all these tiny creatures on the rim of the jar waiting to leap into the room. I don't think she has ever recovered from that. Pg...what about semolina then !! ? Lol ! The frogs must have been bursting for someone to build a pond and look what happened. LOL. Lots of Little frogs expected from this lot of frogspawn then.....Good snail and slug detterent. Now I know how jelly babies came about.....oooops! sorry. True Lori...if only a fraction of them make it...good news ! I had a melodious little lady toad who laid ropes of eggs in my other pond...the goldfish cleaned them all up!... sad but true. What a shame Lori, but I suppose they are a delicacy to fish. I like toads, such characters. Every summer I try to put out toad houses...sometimes just a half pot...or make a grotto under a large rock...Come home all ye toads! the trill of the female carries for a great distance...but it isn't intrusive. The lady toad that sang for weeks til her prince came, was quite loud...but it never disturbed our sleep. Hi Lori and Lindak.We have toads too but dont usually see them until late spring when they come out of their nooks and crannies on rainy days ! They dont lay their eggs in our pond though..well not as yet anyway !